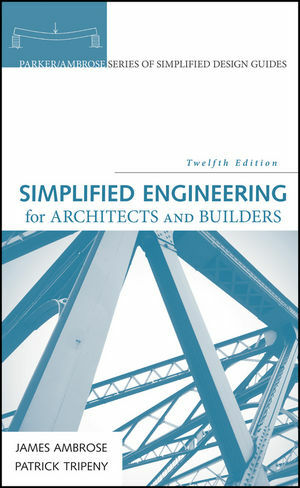 Simplified Engineering for Architects and Builders is the go-to reference on structural design, giving architects and designers a concise introduction to the structures commonly used for typical buildings. The clear, accessible presentation is designed to give you the essential engineering information you need without getting bogged down in excess math, making this book an ideal reference for busy design professionals. This new 12th edition has been completely revised to reflect the latest standards and practices. The instructor site includes a complete suite of teaching resources, including an instructor's manual. Structural design is an essential component of the architect's repertoire, and engineering principles are at the foundation of every sound structure. You need to know the physics, but you don't necessarily need to know all of the math. This book gives you exactly what you need without losing you in a tangle of equations, so you can quickly grasp and apply the material. The industry-leading reference for over 80 years, Simplified Engineering for Architects and Builders is the definitive guide to practical structural design. JAMES AMBROSE is Editor of the Parker/Ambrose Series of Simplified Design Guides. He practiced as an architect in California and Illinois, and as a structural engineer in Illinois. He was a professor of architecture at the University of Southern California. PATRICK TRIPENY is the Director of the Center for Teaching and Learning Excellence and is a Professor of Architecture at the University of Utah. He teaches the architectural structures sequence in the School of Architecture and the graduate design studio. He is the recipient of several teaching awards including the ACSA/AIAS New Faculty Teaching Award in 2001 and the University of Utah's Early Career Teaching Award in 2000-2001.